Full Sail Partners, a Deltek Platinum Partner, is proud to announce that it has been recognized by Accounting Today on the top 100 VAR list for 2017. Accounting Today annually chooses the top value-added resellers (VARs), and Full Sail Partners has been ranked in the top 100 again this year. Not only was Full Sail Partners named on the 2017 list, but it impressively moved up in ranking by fifteen. Accounting Today also reported recognized trends from this year's top 100 VARs. Some of those trends included responding to talent demands, adapting to the cloud, and smaller clients demanding better technology and analytics. Full Sail Partners has positioned itself to respond to these exact needs. With its Blackbox Connector capabilities and emerging business intelligence offerings, Full Sail Partners intends to keep developing solutions to fit client growth and desires. Accounting Today is a leading provider of online business news for the accounting community, offering breaking news, in-depth features, and a host of resources and services. 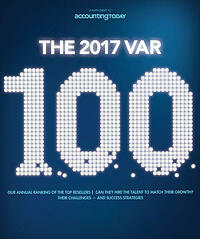 The VAR 100 list is annual report developed to rank the top technology resellers in the account and ERP space.